"With this system, all of the information is right in front of us, posted directly by the school districts and others. It is automatically updated, organized logically and very easy to read. It speeds the information process at a time when time is of the essence. It eliminates steps in which mistakes can be made -- there are no telephone calls to answer, no illegible handwriting or fuzzy faxes to decipher. To top it off, the information is automatically sent into our station's web site, making it even more useful. FlashAlert is a miracle cure. I could go on and on about this, it's so cool." Organizations have breaking news to pass on to the news media. They can call newsrooms with their info -- if they've got an hour -- or fax or email it to you -- and hope you see it, mixed in with everything else. At certain times of the year, such as during a winter storm or after an earthquake, everyone is trying to reach stations and newspapers at the same time. Wouldn't it be better to be able to post information in one place and have a system that passes it on immediately to all of the media and the public? 3: File transfers directly into media websites and TV on-screen graphic systems. 1) Each region's home page (listed below) displays the information within one minute of being received. Stations are encouraged to monitor the page, which automatically refreshes every five minutes. It has a built-in alarm that flashes the browser tab and plays a tone with the arrival of new emergency information, even if the page is minimized. The page sorts by category by default; you may toggle it to view by message type or in reverse chronological order (useful on a busy day when you just want to see the latest info coming in). The report page also has a link to the archives for news releases (one month) and sports scores (one week). 2) Every 15 minutes, the latest emergency information is e-mailed to radio and TV station and newspaper newsrooms. News releases are sent immediately. Emails can be sent to as many people in your newsroom as you wish. Are your email addresses up to date in FlashAlert? Click here, select your region, then city, and if you need to make changes, please email Craig@FlashAlert.net. 3) Also every 15 minutes, all information is automatically pushed into participating news media websites, where the public can view it. You can receive the info in HTML or XML format, at no cost. Click here for a description of the types of files available for your station website and/or on-screen graphics. At 11 a.m., emergency messages pertaining tolate openings delete. At 7 p.m., the rest of the day's information deletes and subscribers begin placing information regarding the next day, for use in 10 and 11 p.m. television newscasts. (Organizations may post information before 7 p.m. and mark that it pertains to the next day, and that information stays alive through the night.) News releases stay in the archive for one month and sports scores for one week. 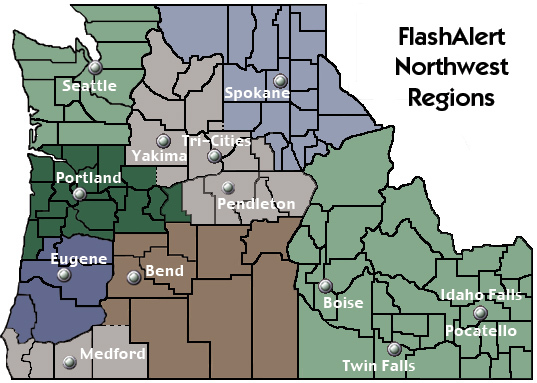 FlashAlert is operated by Craig Walker Communications, Inc., which has managed emergency communications for the school districts in the Portland-Vancouver area for 34 years. There is no cost to the media and organizations pay a fee ranging from $130 to $250 per year, depending on size. Bend - Central & Eastern Ore.